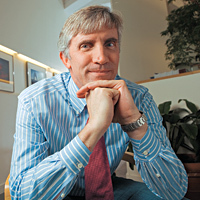 U.S. carbon regulation is "the most important climate issue in the world," says Jon Anda '80, president of the environmental markets network at Environmental Defense, a nonprofit whose mission is to solve pressing environmental problems with the tools of business, science and policy. Anda enrolled in the Kellogg School's One-Year MBA Program immediately after completing his undergraduate degree. "It was 1979, 1980, and we were in the middle of an energy crisis," he says, adding that he had a strong interest in renewable energy and considered a career with the U.S. Environmental Protection Agency. But energy prices plummeted and funding for renewables dried up, so Anda took a different path that led him to a distinguished financial services career, including at Morgan Stanley. "My 20 years at Morgan Stanley really gave me the option to do a lot of different things, including staying at the firm," he says. Instead, Anda decided to take a leadership position at Environmental Defense, where he was previously a member of the president's advisory council. His work there combines several disciplines. "It's about science, politics and policy," says Anda. Since its inception in 1967, Environmental Defense has earned accolades from sources as disparate as Wired magazine and The Economist. It has been instrumental in a number of well-known and successful public-policy changes, including the 1972 ban on the chemical DDT and the 1990 Clean Air Act. The organization brings together scientists, lawyers, business leaders and policy experts to work toward the common goal of preserving the natural world. Anda says he and his colleagues check their personal politics at the door. "We never get involved in partisan politics," he says, adding that the cohesiveness of the diverse group speaks to the urgency of the issues it addresses. For example, Anda says, the United States needs to reduce its carbon emissions by 80 percent by 2050 to stave off the worst effects of global climate change. "These are big, big numbers." Though some businesses have already started to go green, reducing or pledging to reduce emissions voluntarily, Anda maintains that they won't be able to avert crisis on their own: "You won't see the voluntary system grow in the United States to meet the challenge. It will not happen. Not even close." According to the experts at Environmental Defense, many business leaders agree. "It's very rare when you have businesses across a variety of industries come together in favor of comprehensive regulation," says the Kellogg graduate. As the reality of global climate change becomes sharper, he explains, business leaders know they'll have to learn to succeed in an emissions-restricted environment. The sooner they know what the limits are, the quicker they can start figuring out how to meet them. Environmental Defense advocates a cap-and-trade system as a necessary first step. "We want a cap on emissions in the United States — a cap on our emissions that reduces over time and a trading system that is linked to the global trading system," says Anda. While the consequences of climate change may seem insurmountable to the untrained observer, Anda's outlook is positive. "It's very, very rewarding," he says. "I love my work. I love doing something for others and not just for my wallet." He adds that for all the cosmetic differences between working at an international financial services firm and a nonprofit aimed at protecting the environment, the particulars of his work are not actually so different. "I'm really practicing my trade in a different context," says Anda. "I feel like I'm a capital markets banker to the environment."